We have another great Corporate Partner sponsoring an awards category at our 25th Birthday sponsored by Metronet. Brooks Macdonald Asset Management Ltd is a specialist investment manager providing discretionary management services for private clients, trusts, charities and pensions funds. The company have offices in both Manchester City Centre and Hale and have been a Manchester Million supporter for some time and have chosen to sponsor our Fundraiser of the Year award for our celebratory event in February next year. The Fundraiser of the Year award recognises an individual who has raised money for Forever Manchester relentlessly over the course of the year, creating real change within the communities of Greater Manchester. The winner of this award will be dedicated, passionate and consistent in their efforts. Claire Bennison, Regional Director, said: “Brooks Macdonald has a long-standing culture of charitable giving and we are delighted to support Forever Manchester in their excellent work with the local community.” Award winners will be announced on the night. The event will be hosted at The Midland Hotel on 20th February 2015. For full details on these categories and to see other sponsorship opportunities available to your business click here. 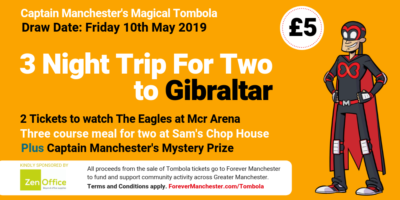 Alternatively, if you’re interested in purchasing tickets or a table of 10 for the event visit our event page or contact us by emailing marketing@forevermanchester.com or calling 0161 214 0940.